Steelmakers are in growth mode in the U.S. right now. Nucor and Steel Dynamics are the two best stocks to own in the industry, and dividend investors should give them a close look. 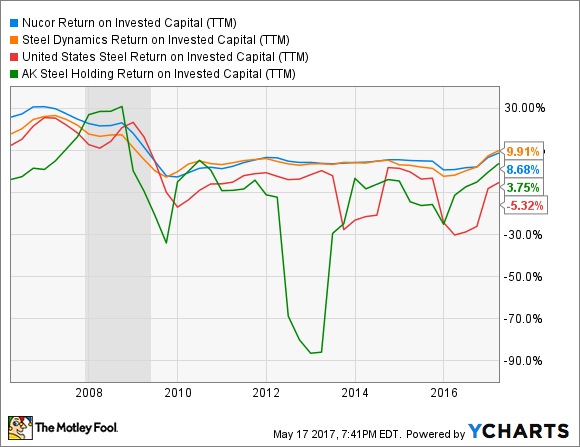 If you like dividends, heavily cyclical industries such as steelmaking can be a tough place to find viable investments. After all, the industry can see demand turn on a dime, shifting companies from feast to famine quicker than you can say "time to cut expenses." 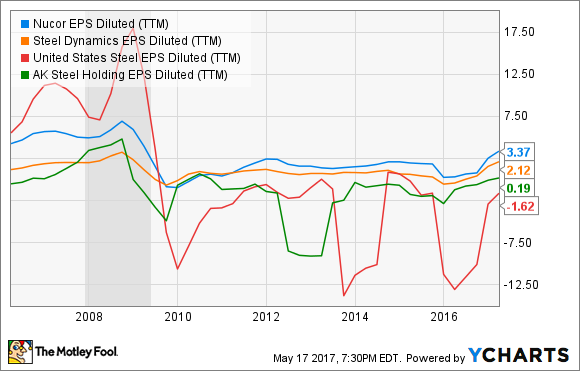 And while this makes the majority of steel companies unfit as investments, investors would do well to consider Nucor Corporation (NYSE:NUE) and Steel Dynamics (NASDAQ:STLD). Not only do they both have operational advantages that give them a leg up, but they are also the best capitalized and best run steelmakers in the U.S., and maybe the world. And this financial and operating strength has not only allowed them both to pay a solid dividend, but it has also provided the cash flows to regularly increase payouts since the end of the financial crisis. Keep reading to learn what sets Nucor and Steel Dynamics apart from the competition, and why they both should be able to continue growing profits and dividends for years to come. For a number of years, the U.S. steel industry has been in disarray, plagued by illegally subsidized imports from countries with heavy government influence in their steel operations. This has been a double-whammy for U.S. steel producers, since it not only caused prices to plummet for steel goods but also reduced the output from domestic foundries, many of which have very high fixed expenses and must operate at high capacity to make a profit. The good news is, things are looking up for the American steel industry. A number of trade actions have taken effect over the past year, and that's already started reducing the share of steel going to imports while also driving prices up to more profitable levels. Furthermore, there are more trade actions working through the system, which are likely to further reduce imports from countries that violate fair-trade practices, helping boost U.S. steelmaking even higher. It's already paying off big for Nucor. Most importantly, this is happening in an environment where demand for steel continues to remain high and is likely to grow. Yes, the energy industry continues to be challenging (though there are signs of improvement as drilling activity has increased), and U.S. auto sales look to have peaked last year, but a relatively strong consumer economy, a likely increase in infrastructure spending, and a growing housing market all bode well for the chances that near-term demand will remain strong. These two steelmakers get a significant advantage from their "minimill" operations. Historically, steelmakers have built very large steel mills, with the idea that once they're at a certain output level, incremental volume growth yields massive profits. The problem with these megamills is that when demand is weak, very high fixed expenses lead to massive losses. Furthermore, shutting a steel mill down -- particularly if you plan to fire it back up quickly -- isn't always an option, since major capital investments must be made to reactivate an idle mill. This situation often forces steelmakers that rely on these kinds of operations to run at a loss for periods of low demand, a painful experience for any investor who's owned shares of a company such as U.S. Steel (NYSE:X) or AK Steel (NYSE:AKS) during a steel downturn. That's two huge benefits when it comes to paying a dividend. While U.S. Steel has only managed to pay a very small $0.05 quarterly per share and AK Steel hasn't paid one at all since 2012, Nucor and Steel Dynamics have been able to steadily grow their dividends since the end of the financial crisis. Even with most steelmakers positioned for profitable growth in the coming years, because of strong economic indicators, high demand, and a more fair competitive environment, the good times will eventually come to an end. But Nucor and Steel Dynamics are a rare breed of steelmaker that can operate profitably through pretty much every market environment. And that's what makes them excellent dividend stocks in a tough industry. Lastly, both are reasonably priced, with Steel Dynamics trading for 11 times 2017 earnings estimates and Nucor trading for 12.5 times estimates. 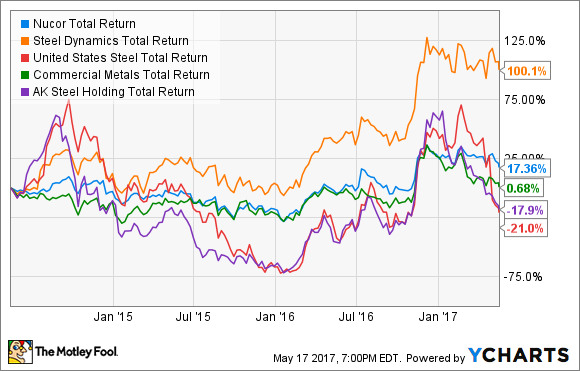 Add it all together, and not only are Nucor and Steel Dynamics far and away the best dividend stocks in the steel industry, but there really aren't any others that come close.